Here at Local-Attorneys we strive to provide our visitors with an easy, stress-free means of finding high quality law professionals in their area. Our visitors find us because they have actively searched the internet for law services or information pertaining to exactly what your practice specializes in. This means all the leads you receive are top notch, and of the highest quality. Don't waste your time with empty leads from un-interrested vistors with those other companies. 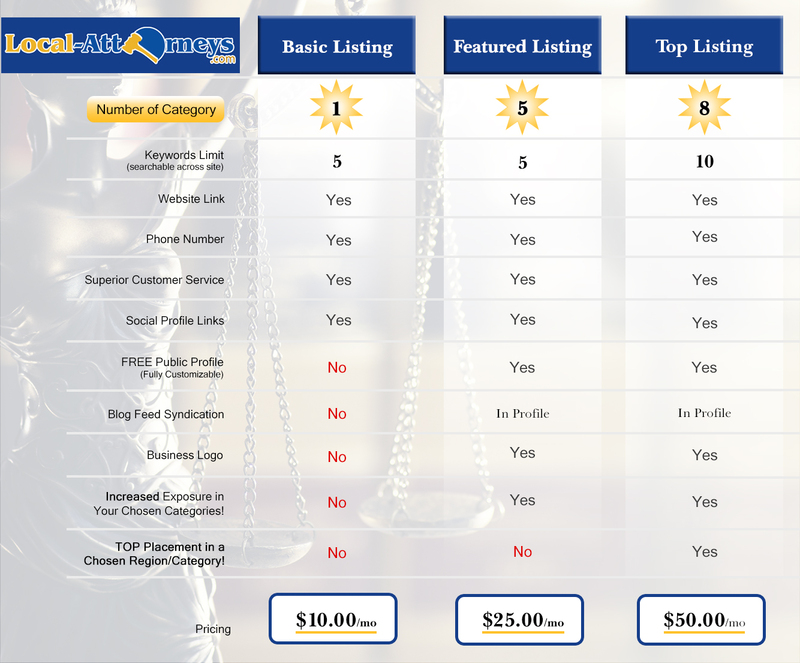 Join Local-Attorneys unbeatable legal directory, and start hearing from potential clients who are actively searching for your services! Attention attorneys and law firm marketers... you can now add your law firm to Local-Attorneys.com! Let us help you grow your business as we have done with so many other quality law firms and legal professionals. We know finding advertising that works can be difficult, so we make it easy for you! Get started today and have extremely interrested potential clients knocking at your door!